I’ve always counted Huntington Estate as one of the forgotten labels of the wine industry. The sort that just to blend into the fabric of the wine industry and either keep on keeping on, working a celebrated history, or gently fade into obscurity. Often, this classic personality is admirable – like the timeless quality of Craiglee or Lakes Folly, where the personality of the wines are set, and there is no need to change. For other producers (like Virgin Hills), the appeal of old school wines tends to wane until oblivion. If you’re judging purely on label designs, then the utterly retro Huntington Estate labels feel very dated. But beyond the labels lies a style that has a hint of agelessness about it. Of a wine that is unapologetically old school, unchanged, and built to live forever. Only problem, of course, with wines like that is that they can look awkward young – and the Cabernet is still coming together, even as a bloody seven year old. Conversely, the new dessert wine is already in the drinking zone, if also built in a very traditional Aussie dessert wine mode. Old school wines, in dated packaging – I wonder if it sells? From vines planted in the 70s, this is rustic from the outset, much like the label. Form is unchanged too, red maroon colour leads to a nose of ironstone, blood and baked earth. Mudgee mud. Dry, firmly tannic and acidic palate is stridently structured, ultra drying and really unyielding – all ferrous earth in every direction. Net result is a wine that that is hardly seductive now, but built with such structure that it will live forever. Seriously, another twenty years at least. Will it every become an easier wine? Drink: 2022-2042+. 16.5/20, 88/100+. 13.8%, $26. Would I buy it? Not yet. Interesting to try in many years time. Produced from botrytised Semillon, produced from a plot of vines that would normally yield 10 tonnes of grapes and this year produced just four, all of which turned into 1800 litres of juice. Gee, the economies of dessert wine are rubbish aren’t they? 40% of this went to new oak for five months. The style, surprisingly, is pretty clever really – heavy with botrytis, lemon and apricot, it’s viscous and thick yet surprisingly sprightly and energetic on the finish. Very much an Aussie ‘sticky’ but a good one. Drink: 2016-2022. 17.5/20, 91/100. 12%, $36. Would I buy it? I’d drink a glass. Good morning, Andrew. I read your reviews often and like your perspective, then I saw this sentence just now: Huntington Estate are one of those labels that tend to blend into the fabric of the wine industry. No offence taken Kim. All good. Haven’t bought Huntington Estate for many years but it was the winery I grew up on in my University days back in the mid to late 1970’s. I somehow managed to buy a lot from Mudgee & the Hunter back then and this continued through to the mid 80’s then children and mortgages got in the way. Started buying seriously again about ten years ago but my tastes have changed and I haven’t taken much interest in Mudgee wines in recent years. Maybe I should have a look again? It is a “classic” label but a facelift might not be a bad idea. 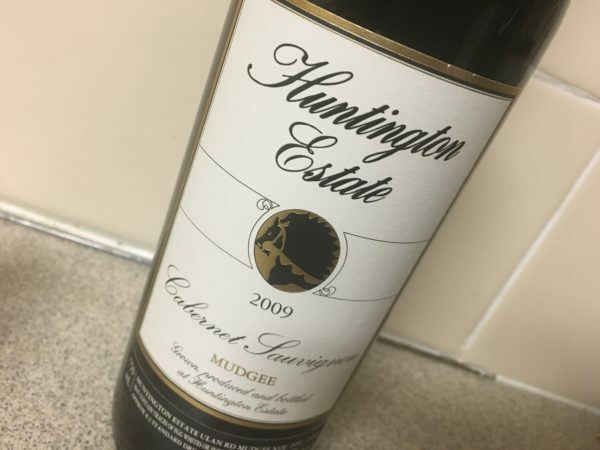 I think many people have fallen out of love with Mudgee reds over the years Bob, and I’m not sure the old school style of wines (like the Huntington Cab) is going to do help either….